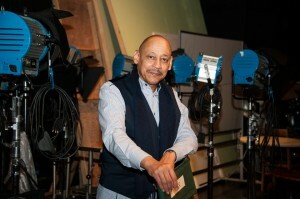 Nate Thomas, head of CSUN’s film production program. Photo by Lee Choo. California State University, Northridge film professor Nate Thomas has earned a second regional Emmy Award nomination for a television public service announcement (PSA) campaign he directed and produced for the FBI on cybercrimes. The three 30-second spots — on ransomware, business email compromise and intellectual property theft — were nominated for an Emmy in the PSA (single spot or campaign) category. The winners will be announced at the National Academy of Television Arts and Sciences’ annual Pacific Southwest Emmy Awards Gala, scheduled for June 16 in Rancho Mirage. The project was done through Thomas’ production company, which specializes in making PSAs, what he calls “doing social work using film and other media.” Thomas shares the nomination with actor/director Tim Russ, who co-produced the spots. Working with federal law enforcement officials and assisted by a team that included CSUN students and faculty, Thomas created a series of 30-second ads to educate the public about cybercrimes. The ads first aired regionally and now appear on television stations across the country. Thomas said the number of cybercrimes is growing, and it is important to educate the public about the threats. “Ransomware — the use of a virus to encrypt important files and documents until a ransom is paid — has grown into a significant threat to not only U.S. businesses, but individuals as well,” he said. “Business email compromise is a type of payment fraud that involves the compromise of legitimate business email accounts for the purpose of conducting an unauthorized wire transfer. Intellectual property theft involves robbing people or companies of their ideas, inventions and creative expressions known as ‘intellectual property,’ which is everything from trade secrets and proprietary products to movies, music and software. “All of these are serious threats to Americans and their businesses, yet a lot people don’t take them seriously, or don’t realize how vulnerable they are to becoming victims of these crimes,” he said. The PSA on ransomware can be viewed at https://www.youtube.com/watch?v=F-hseHPDITs. The PSA on business email compromise can be viewed at https://www.youtube.com/watch?v=u3nAeVNSV24. The PSA on intellectual property rights theft can be viewed at https://www.youtube.com/watch?v=Qm_zXmnO9po.